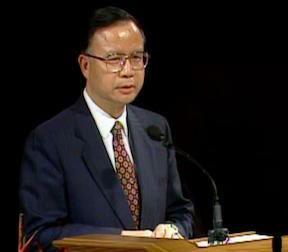 Tai Kwok Yuen served as a General Authority of The Church of Jesus Christ of Latter-day Saints from June 6, 1992 to October 4, 1997. He served in the Second Quorum of the Seventy. Tai was born on June 30, 1941, in Hong Kong and was baptized in 1959. Prior to his service as a General Authority, he was a regional representative and president of the Hong Kong Mission. He served as president of the Hong Kong China Temple from 2004 to 2007. He and his wife, Lai Hui Hua (Flora), are the parents of three children. He worked in chemical marketing, property management and investment. This page was last edited on 27 May 2017, at 15:13.